Calling cards can be printed with your name to make a sophisticated gift enclosure and a distinct first impression. The base price is for a set of 100 2-ply calling cards measuring 3 1/4" x 1 9/16". Please note that the preview is not to scale. If your order includes a new engraving plate, you will receive a proof. Additional customization options including heavier card stock, edge treatments, new engraving plates, and return address engraving are available for an added cost. You will see the subtotal for your order as you add features below. 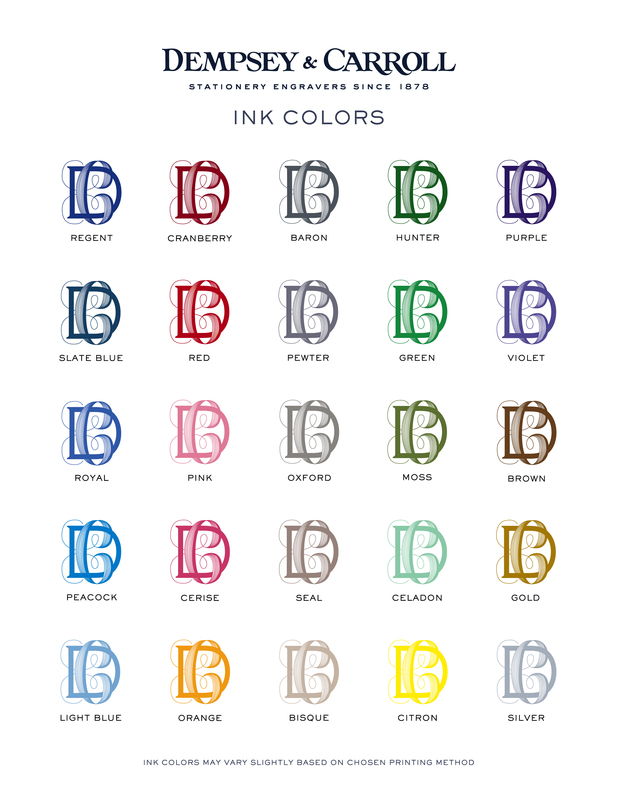 Please click on the following links to view our standard ink colors and typestyles. Please allow 6 weeks for production of your custom order. Please contact us if you would like to inquire about expedited options, if you would like to order a quantity greater than 100, or if you would prefer to work directly with one of our associates at 212-570-4800 or info@dempseyandcarroll.com. It remains our pleasure to be of service. Dimensions: #122 - 3 1/4" x 1 9/16"